Added on May 10, 2017 by Betsy Johnson Welty. Douglas Land Conservancy's 4TH Annual Plein Air Event - Save the Date! I'm excited to announce that I have been invited to participate in the 4th Annual Douglas Land Conservancy's Plein Air Art Exhibition and Sale, "Capturing the Beauty of Open Land." The art sale will take place June 24th and 25th, 2017 in Castle Rock, Colorado. 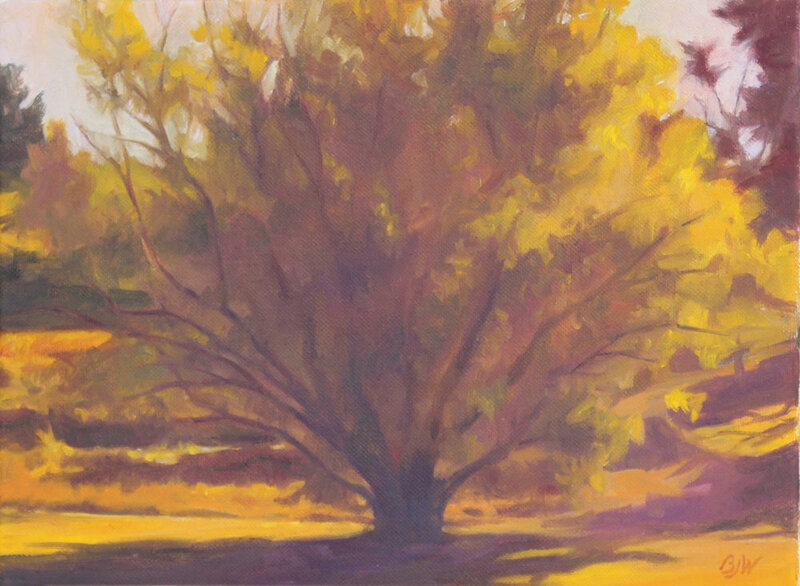 Participating artists will be painting en plein air (outside in the fresh air) on conservancy land for four days leading up to the art sale, which will feature their best paintings made that week. Douglas County, Colorado is located south of Denver and north of Monument and features beautiful western vistas of the front range and Pike's Peak, as well buttes, rocky outcroppings and green valleys. Added on March 29, 2017 by Betsy Johnson Welty. Plein Air Artists of Colorado (PAAC) members and Colorado Pastel Society members say "cheese" for a group photo in the Parker, CO studio of Lorenzo Chavez. Afterward we headed out for a day of painting at Hidden Mesa Open Space in Douglas County. We dressed warmly and had our boots on as it was a cold day in January. Added on March 4, 2017 by Betsy Johnson Welty. This oil painting was a 9" x 12" plein air work that I painted in Denver's Harvard Park just days before Thanksgiving when the city was experiencing unseasonably warm weather. The tree was backlit and my goal was to capture the sunlight's "glow" as it illuminated the golden autumnal foliage. "Lovely as a Tree" by Betsy Johnson Welty, oil on canvas, 9" x 12"
Added on February 16, 2017 by Betsy Johnson Welty. Added on October 7, 2016 by Betsy Johnson Welty. I am proud to announce that I have been accepted as an Associate Member of Women Artists of the West. WAOW reviews an artist's portfolio, exhibition and award history in making their decision to admit new members. As an Associate Member, I am joining a prestigious group of accomplished professional women artists. This organization is not a network of artists who paint Western-themed art, but rather a national group of 200 or so female artists who live, work and exhibit all over the country. Added on October 1, 2016 by Betsy Johnson Welty. I am excited to announce that I have two paintings in the Evergreen Artists Association Annual Juried 2016 Colorado Artists Show. My painting shown above, "Coeur d'Alene Mine Autumnal, Central City," won an Honorable Mention!! The exhibition is hosted by Main Street Fine Art Gallery in Evergreen, Colorado and runs through October 23rd, 2016. Added on September 6, 2016 by Betsy Johnson Welty. My watercolor, "Autumnal Suite," (seen above) was selected to hang in the Framed Image Gallery show, "Fall Into Place." The show runs from September 1st - Oct. 28th. Framed Image Gallery is located at 5066 E. Hampden Avenue, Denver, CO 80222. Added on May 26, 2016 by Betsy Johnson Welty. I'm honored to announce that my oil painting, "Washington Park Evening," was juried into the Greenwood Village 33rd Annual All Colorado Art Show. I am also excited to announce that my oil painting, "Coeur d'Alene Mine Autumnal, Central City," was accepted into the 69th Annual Gilpin County Arts Juried Show in Central City, Colorado. Added on April 17, 2016 by Betsy Johnson Welty. It was a beautiful September day when I painted this oil plein air scene of Hildebrand Ranch Park, just west of Denver Botanic Gardens Chatfield Farms. Hildebrand Ranch Park includes the barn seen in my painting and is part of the Jefferson County Open Space system. Denver Botanic Gardens Chatfield Farms has preserved the original Hildebrand Ranch cabin and other farm buildings which date back to the 1860's. The locale was once Native American hunting grounds and was settled in 1866 by Frank Hildebrand as a cattle grazing area. The Jeffco portion of the preserved ranch, a 1,653-acre park, is situated along Deer Creek and is home to prairie dogs, mule deer, elk and even mountain lions and bears. A coyote crossed the meadow while I painted, and a hawk was later seen flying overhead. The only noises heard came from the occasional sound of a car on Deer Creek Canyon road. This location was a wonderful and nearby escape from the city.